If nonhuman nature could speak with a human voice, she’d sound a lot like Janine Benyus. Of course, human beings are a part of nature, not apart from it, and that has long been Janine’s most essential message. Her work as an ardent naturalist eventually led her to get under nature’s skin sufficiently to ask what is perhaps the most basic question people need to address to live sustainably on the land: What would nature do here? That deceptively simple query resulted in her momentous exploration of an emerging revolutionary approach to science and design chronicled in her landmark book, Biomimicry: Innovation Inspired by Nature. Janine is an educator and life sciences writer who has degrees in forestry, natural resource management, and English literature. She combines a deep appreciation of science with an abiding love of the natural world. And she is no armchair naturalist: she has written three great regional field guides and a sly animal behavior guide, Beastly Behaviors. She’s been a backpacking guide and is active in protecting wildlands in her home state of Montana. 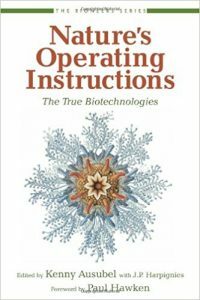 In the following excerpt from Nature’s Operating Instructions (Sierra Club Books, 2004), Benyus writes about why humans should learn from nature rather than merely about it—taking cues from complex systems that have developed over millions of years and applying these lessons to manmade systems. Watch a video of Janine Benyus’ 2016 Bioneers keynote at the bottom of this article. It has been a wonderful fall in the Rockies, with cottonwoods and aspens more brilliant than I’ve seen them in years. When you duck into the groves, the air itself is golden. Quaking aspen has a great name: Populus tremuloides. It describes on the tongue what the aspen does, which is to tremble in the slightest breeze, with a sound like bones rattling. My scientist friends have another explanation. The stalk of the aspen leaf is flat, so that when the wind hits it, the leaf tilts, spilling the wind like a sail. It doesn’t build a rigid structure. It yields to the wind, and this yielding allows it to live on absurdly steep slopes where winds would pick other broad-leaved trees clean. Both stories are about humility and adaptation, about yielding when it’s good to yield. There’s something else going on in the Rockies these days, and it’s similar to what happens here each year in October at the Bioneers Conference. It’s called interspecies flocking. It’s fall, and a tough winter is coming. Everybody needs to put on a nice layer of fat, so birds that normally would not associate with one another—different species, such as chickadees and warblers and woodpeckers—flock together and fly in ensemble through the canyons. They lay down their arms and hook up in their diversity, in their difference. They hook up because they know that the berries are scattered and together they can spread out and find more than one bird could alone. If you think of berries as ideas, that’s what we’re like. Different people get together and say, “I’ve found an idea over here that may lead to sustainability,” and we that idea. We’re a mixed-species flock and winter is coming. One of the ideas in that mosaic is biomimicry. Biomimicry is innovation inspired by nature, looking to nature as a teacher. One language caveat: Inherent in the phrase “looking to nature” is the lonely idea that we are not nature—that we’re peering in from the outside. But that’s not what I believe. I see us as biological organisms, and that means we are nature. There’s no separation. So forgive the awkward rhetoric, but when I say “nature,” I’m referring to what writer David Abrams calls “more than- human” nature—our biological elders who have been here much longer than we have. Compared to them, we just arrived and have everything to learn about how to live gracefully on this planet. If the age of the earth were a calendar year beginning on January 1, and today were a breath before midnight on December 31, it would mean that Homo sapiens sapiens got here fifteen minutes ago and all of recorded history blinked by in the last sixty seconds. It’s an eyelash on that timeline. Bacteria bootstrapped themselves up out of the chaos in March of that theoretical year, and in the 3.8 billion years since, life has learned to do some amazing things—to fly, circumnavigate the globe, live at the top of mountains and the bottom of the ocean, lasso solar energy, light up the night, and make miracle materials like skin, horns, hair, and brains. In fact, organisms have done everything we humans want to do but without guzzling fossil fuels, polluting the planet, or mortgaging their future. So yes, we are part of nature, but we’re a very young species still trying to get it right. When I look at technology these days, I don’t say “yes” or “no.” I ask how well adapted a particular technology is. How well adapted is that product, that process, that policy to life on earth over the long haul? That’s the key question. Ninety-nine percent of species that have been on earth are now extinct because their products or their processes were not well adapted. Together, life’s adaptations spell out a pattern language for survival. Think of the wood frog that can freeze solid in winter and hop away unharmed in the spring. Or the much maligned garden snail that builds its own highway of slime, a lubricant that absorbs 1,500 times its weight in water almost instantly, allowing the snail to climb up and over a thorny branch without hurting itself. Banana slugs can do the same thing. We humans don’t have anything close to that in terms of an effective lubricant. Rhino horn surprises us by healing when cracked, even though the horn has no living cells in it. We don’t know how it manages to do that, but what a great model for self-healing materials that wouldn’t have to be thrown away. Up on the northern California coast is the western hemlock, a denizen of our northwestern rain forests, each tree with sixty million needles that tilt like Venetian blinds to catch the sun and then comb moisture out of the fog, so that 30 percent more moisture lands on the ground around a western hemlock than anywhere else in the forest. The breathing pores of those needles are deeply embedded, tucked away in the wax, so the wind can’t wick their water vapor away. Now why is it that a tree that receives up to a hundred inches of rainfall a year has all those adaptations for drought? It’s because there are two glorious rain-free months in summer, and that’s a long, dry time if you’re a tree. So well-adapted species have done the obvious—they’ve acknowledged the limits and evolved adaptations for drought, even though they’re in a rain forest. Another of my favorite examples is the hummingbird, an organism about the size of my thumb. It flies up to 35 miles an hour (faster than you can get around most cities in a cab) and migrates about 2,000 miles a year. Those journeying down the eastern flyway reach the lip of the Gulf of Mexico and then pause for a while, fueling up on 1,000 blossoms a day. Finally, they burst across 600 miles of open water without stopping, on a whopping 2.1 grams of fuel. And that’s not jet fuel: it’s nectar. But here’s what amazes me even more. In the process of fueling up, the hummingbird manages to pollinate its energy source, ensuring that there will be nectar next year—for itself, for its offspring, or for completely unrelated species of nectar feeders. Imagine doing that at your gas station. And of course, when it dies, its body decays and nurtures the roots not only of flowers, but of mushrooms, grasses, trees, and shrubs. There’s nothing special about it; no government regulations are behind it, it’s simply part of the system that keeps us all alive. In the process of meeting their needs, organisms manage to fertilize the soil, clean the air, clean the water, and mix the right cocktail of atmospheric gases that life needs to live. What life in ensemble has learned to do is to create conditions conducive to life. And that’s what we have to learn. Luckily, we don’t need to make it up. We need only step outside and ask the local geniuses that surround us. The key question for a biomimic is “What would nature do here?” And that’s a rare question, even for ecological designers. We tend to puzzle instead over how to tweak our conventional solutions. For instance, when we want to clean a surface, we get hung up on questions such as “What’s the least toxic detergent to use?” or “How can I reduce the energy involved in sandblasting?” A more helpful question might be “How does nature stay clean?” Other organisms don’t use detergent or sandblasters at all, and yet many of them depend on staying clean for their survival. A leaf, for instance, has to stay dirt-free so it can breathe and gather sunlight. Botanists in Germany looked to the lotus, a symbol of purity in Asia because it rises from muddy swamps yet remains dry and pristine. Under a microscope, they saw that instead of being smooth, for easy cleaning, the leaf surface is incredibly mountainous. Dirt particles teeter on the peaks instead of adhering strongly, and raindrops ball up instead of spreading out. As the drops roll, they lift the loose dirt particles, like a snowball lifting leaves from your lawn. And it’s not just lotus; many leaves are like this, it turns out. The question then becomes not which detergent to use but how to keep things from getting dirty in the first place. A German company called ispo makes a building façade paint called Lotusan based on the lotus effect. The dried paint has the structure of the lotus leaf, and rainwater cleans the building. The deep design principle is that life surfs for free. Plants use the kinetic or motion energy in falling rain to keep themselves clean. Simple. Wondrous. A leaf has tens of thousands of tiny photosynthetic reaction centers. They’re like molecular-scale solar batteries operating at 93 percent quantum efficiency, which means that for every hundred particles of light that strike the leaf, ninety-three are turned into sugars. That’s stellar in terms of effectiveness. The best part is that these solar cells are manufactured silently, in water, and without toxins. So plant biologists and engineers are finally looking to leaves to help them make a smaller, better solar cell. One of the many gifts of biomimicry is that you enter into deep conversation with organisms, and this student-elder dialogue absolutely fills you with awe. Seeing nature as model, measure, and mentor changes the very way you view and value the natural world. Instead of seeing nature as warehouse, you begin to see her as teacher. Instead of valuing what you can extract from her, you value what you can learn from her. And this changes everything. As Land Institute founder Wes Jackson says, “When we begin to see nature as mentor, gratitude tempers greed and the notion of resources becomes obscene.” My fondest hope is that this gratitude will blossom into an ardent desire to protect the wellsprings of locally evolved wisdom. When we finally realize that unencumbered evolution is more precious than any vein of oil, the rationale for protecting wild places will become self-evident. A lot of the research in biomimicry is years and years from fruition, but it is a path, an approach. It requires us to visit wild places and keep asking, How does nature teach? How does nature learn? How does nature heal? How does nature communicate? Quieting human cleverness is the first step in biomimicry. Next comes listening, then trying to echo what we hear. This emulating is hard and humbling work. When what we learn improves how we live, we grow grateful, and that leads to the last step in the path: stewardship and caretaking, a practical thanksgiving for what we’ve learned. The practice of biomimicry requires community, not just with other organisms, but with people in other disciplines. We need to bring together fields of study that have been kept separate. As it stands now, we educate biologists to learn how life lives, how life has managed to find out what works and what lasts here on the earth. We educate a different set of people to find out how we should feed ourselves, power ourselves, make our materials, and run our businesses. I’ll call these people the engineers, for want of a better word: people who design human systems. So we have the biologists and the engineers, and, very sadly, few people get to work in the fertile crescent between those two intellectual habitats. Yet the rest of nature revels in these in-between places. In fact, abrupt boundaries are rare in nature, and some of the most fertile habitats are commingled edges—like estuaries, where freshwater and salt water come together. I’ve been on a quest to find people who are living in that fertile commingling place, the estuary between biology and human systems design. A pharmaceutical researcher knows that plants are chock-full of medically important compounds and worries that by conservative estimates, four species go extinct with each passing hour. She wonders if there’s a more sensible way to screen plants for potentially useful medicines or foods. A primate researcher might tell her about animals that are thought to self-medicate in sophisticated ways. For instance, chimpanzees with intestinal problem swill leave the troop and travel to find a particular plant, swallow a few choice leaves, and recover within twenty-four hours. It turns out that animals are selecting plants to treat illness, influence their own fertility, and even prevent illnesses. Plants chemists find secondary compounds in these plants that have antibacterial and antiparasitic qualities, and some even show activity against human cancer tumors. So what if we actually followed animals and took notes about what they have found to be useful in the pharmacies of the jungle? Well, here’s the surprise. The hypothetical cross-disciplinary encounters I just described have already occurred, and more are happening every day in field after field. Cell biologists, for example, now realize that every cell in our body is, in a sense, a sophisticated computer, responding appropriately to signals and information from enzymes, antibodies, antigens, and so on, that attract or repel one another, that scan one another and then hook together and self-assemble. Computer scientists are starting to take note of this, and it may lead to a whole new paradigm for computing, because what our computers can’t do very well right now is pattern recognition, and what three-dimensional molecules do so well is pattern recognition, adapting, and learning. On the broader, macroeconomic level, some leading-edge planners, industrialists, and entrepreneurs, concerned about the prodigious waste generated by our economy, are starting to look at ecosystems where densely interconnected species fill every niche you can possibly imagine and eat every crumb before it even falls off the table. They are trying to envision how we could shift our economy from a linear, throughput kind of model to a closed-loop, diverse, highly interconnected system in which only solar energy is coming in, all the “nutrients” are juggled forever in a loop, and very little waste results. The discipline has a name that I hope will someday not be such an oxymoron: industrial ecology. It’s important news that this type of work is actually happening, that some bench scientists are starting to move into that estuary between biology and engineering. I’ve traveled and gone to their labs and spent time with them. They’re trying to pulp wood like a fungus, adhere like a gecko, create color like a peacock, grow ceramics like an abalone, cool a building like a termite, make green plastics like a bacterium, and wick water from air like a desert beetle. It’s very exciting to see the fruits of these cross-pollinations. In writing books about adaptive organisms, I often ask myself what adaptive traits humans have. One thing that seems to make us different from other creatures, as far as we know, is our ability to act collectively—as a whole species—on our understanding. We can decide as a culture to listen to life, to echo what we hear, to not be a cancer on the earth. Having this will and the inventive brain to back it up, we can make the conscious choice to follow nature’s lead in living our lives. The good news is that we have plenty of help. We’re surrounded by geniuses. They are everywhere with us, breathing the same air, drinking the same water, moving on limbs built from blood and bone. Learning from them will take some stillness on our part, so we can hear their symphony of good sense. What biomimicry offers us, in learning from nature instead of just about nature, is the opportunity to feel a part of, rather than apart from, this genius that surrounds us. I do want to sound a note of caution. Biomimicry can’t just be about clever design. We are extremely aware now that we are a single species on a single planet, watershed earth. The earth is abundant and resilient, but she is not endlessly abundant nor endlessly resilient. Our most important work right now is to figure out how to share our global commons equitably, and how to treat it with infinite justice and care. We must learn to lighten our footfall. We in the United States take up about thirty acres of bioproductive land and sea per capita right now, and there are only five acres per person available globally. Our ecological footprint is a clown’s shoe compared to that of the rest of humankind. I believe that by consciously emulating life’s genius, we can start to reduce that footprint and live in better-adapted ways. So mimicking natural form is only the first part of becoming better adapted. We can mimic the self-opening and -closing hooks on an owl feather, say, to get a backpack that opens anywhere without the need for a metal zipper. But if we make that backpack out of petroleum-based nylon, and we make it in a sweatshop, and we put it on a cross-continental truck spewing diesel fumes, what’s the point? Mimicking natural form is a start, but really learning from nature means remembering that the feather is part of an owl that self-assembles on that owl through nature’s chemistry. A deeper mimicry has to do with mimicking not just form, but also nature’s processes and ecosystem strategies. That owl is fit because it fits its context. It’s part of the forest, which is part of a watershed, which is part of a biome, and it follows rules that are consistent at each level of that nested system. 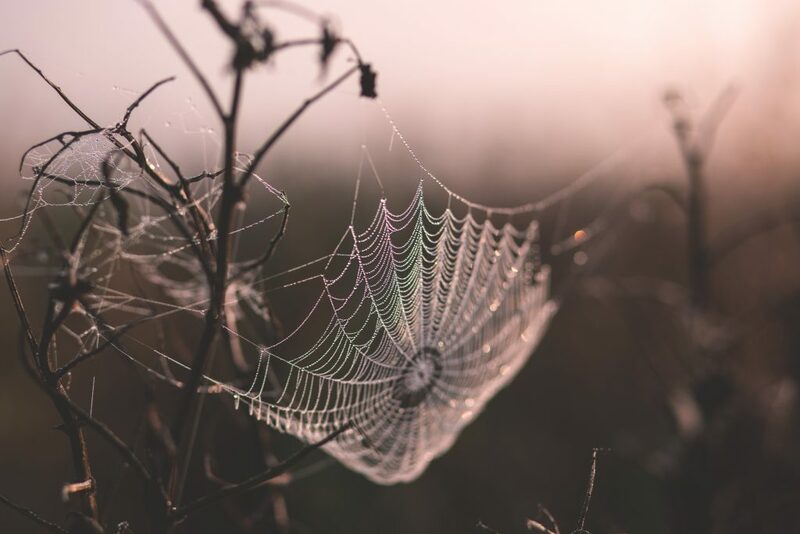 Until we create products that, in their manufacturing, use, disposal, and marketing, are part of an economy that mimics a living system rather than a machine, we haven’t reached the full extent of biomimicry. I’m going to end with a biomimicry story, an episode that brought some of my most exciting fantasies of cross-disciplinary explorations to life. After attending a workshop I gave at the 2000 Bioneers Conference, a woman named Mary Hansel, who works for a conventional wastewater treatment and water purification firm, proposed that we take the company’s lead engineers to the Galapagos Islands to see if biomimicry could stimulate them to think in new ways. A boat trip to Darwin’s islands was a dream come true for me as a biologist—they were at the top of my life list of places to go. And the Galapagos are extraordinary. This series of islands came up out of the sea 600 miles west of Ecuador as completely uninhabited lava cones, until critters started to raft in on the twelve ocean currents that converge there. Critters who showed up exhausted on the shore woke up the next morning to a whole new world. The landmass was smaller than many of these animals were used to, there was different food, if food at all, and most important, there were many different critters there that they weren’t used to. But eventually, over a long period of evolution, they knitted together a society. They tuned themselves to place and placed themselves in community. And most amazingly, they built soil, cleaned the water, filtered the air, and sweetened the Galapagos; they created conditions conducive to life, as life does. When we got there on the boat, I asked the engineers, “Why don’t you tell me what it is that’s keeping you from purifying water in a sustainable way, and then we’ll go snorkeling to find organisms that are solving those same problems.” Initially, I got blank stares and an arms-folded-across-the-chest kind of resistance. The first day was a cacophony of whirring cameras, because they were attempting to take nature’s face home; nature was scenery. But then there was a shift, and after that we could hardly get them to come back to the boat. They stayed underwater for hours and crawled through the mud on their hands and knees, cameras forgotten. They kept calling me over, marveling at how creatures were doing what they, the engineers, had been trying to do for years. Here we were, surrounded by filter-feeding organisms with membrane gills, barnacles and mussels secreting underwater glues, and mangroves desalinating water with the sun as their only energy source. Every fish that swam by had the kind of streamlined fluid dynamics they dream of in pipe design. We looked at leaves that were cleaning themselves with microscopic bumps the way the lotus does, and the engineers thought about how that would improve the inside of pipes, where sewage buildups now require flushing with toxins. Another problem these engineers deal with is scaling, the buildup of minerals like calcium carbonate, which they remove with harsh chemicals. To find a better way, we went walking on a beach with thousands of calcium-carbonate shells. I described the intricate shell-making process: “Organisms release proteins into seawater. These proteins self-assemble into scaffolds that attract floating minerals, which land in particular spots on the scaffold and crystallize into shells. “Then they asked the obvious question: “But why aren’t shells huge—why don’t they just keep mineralizing?” You could have heard a pin drop. I told them that shelled organisms know how to release “stop proteins” that adhere to the surfaces of the growing crystal and stop the growth. They actually stop the scaling without toxic chemicals. Now that got their attention. Suddenly they realized that these organisms were no different than they are—engineers trying to solve problems in ways that are life-friendly. The only difference is that these organisms have had about 400 million years of R&D. Could a mimicked version of such stop proteins be used to end calcium accumulation in pipes without toxic chemicals or excessive energy use? they wondered. That’s when I told them about the shell biologist and the engineer who have already created a bio-inspired product that will do what they hoped. This was a whole new way for them to think about living things. For once, they weren’t thinking about how they could use the organisms—they wouldn’t be farming bacteria, or harvesting the barnacles for their glues, or planting the mangroves to filter water. Instead they would be borrowing the barnacle’s recipe and trying to mimic the mangrove’s root membrane design to make a solar desalination device. The change came when they realized that their design challenges—things like better filters, membranes, sealants, and adhesives—had already been solved, in ingenious ways, by other life forms. In a few short days, their stance toward nature changed from that of voyeuristic conqueror to that of admiring, respectful student. Once they got the hang of it, they were positively exuberant and at the same time increasingly respectful of the organisms around them. The change of heart that I saw take place on that boat is what’s really important about this work, even more important than the eco-friendly technologies that might come from it. One project we’ve been working on is creating a huge web-based database of nature’s solutions that will be catalogued by engineering and design search terms, so that people can type in questions such as “How does nature thermoregulate?” or “How does nature package?” and find thousands of biological research papers, pictures, and experts. We want to put this out in the public domain, so that nature’s ideas are never patented. We also hope to create university courses in which people can study biology functionally. Right now, many engineering, architecture, and design students take no biology classes, so this would be a welcome change. Of course, don’t forget that the wellspring of good ideas is readily available to all of us. We’re all designers and we all have an innate knowledge of the biological world. So when you are designing something and you want to ask, “How would nature do this?” go right ahead: Turn the doorknob, step outside, and enjoy the quaking golden light of the aspen grove. After all, it’s not a new gadget that’s going to make us more sustainable as a culture; it’s a change of heart and a new set of eyes, a new way of viewing and valuing the world in which we are embedded and on which we depend. We’re a young species, but we’re very adaptable, and we’re uncanny mimics. With the help of our ten to thirty million planet-mates, I believe we can learn to do what other organisms have done, which is to make of this place an Eden, a home that is ours but not ours alone. This excerpt has been reprinted with permission from Nature’s Operating Instructions, edited by Kenny Ausubel with J.P. Harpignies, published by Sierra Club Books, 2004.